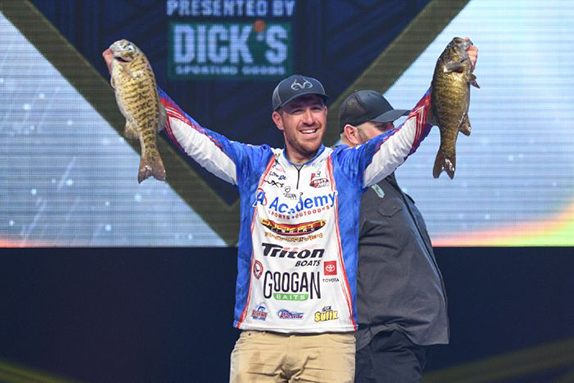 Jacob Wheeler weighed the only all-smallmouth bag of the event on day 2 of the 2019 Bassmaster Classic. No football-head jigs. No creature baits. No Senko-style stick worms. 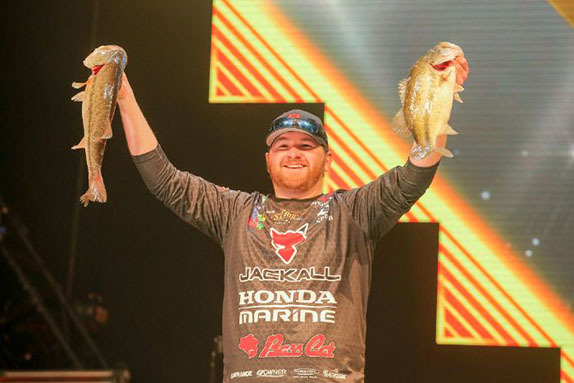 No question, the 49th annual Bassmaster Classic, which took place on the upper portion of the Tennessee River out of Knoxville, Tenn. (Fort Loudoun-Tellico lakes), was dominated by hard baits designed to be chunked and wound. 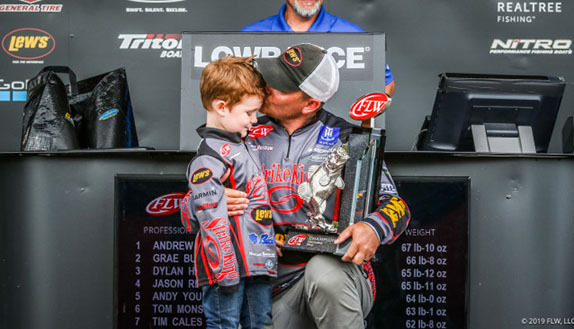 Cranking was the primary program for the top-5 finishers (and just about everybody else in the 52-angler field) as they pursued largemouth and smallmouth bass that were feeding up for the spawn. Following are some pattern details for the 2nd- through 5th-place finishers. Jacob Wheeler came within one place of joining George Cochran, Davy Hite, David Fritts, Dion Hibdon and Luke Clausen as winners of both the Classic and Forrest Wood Cup. 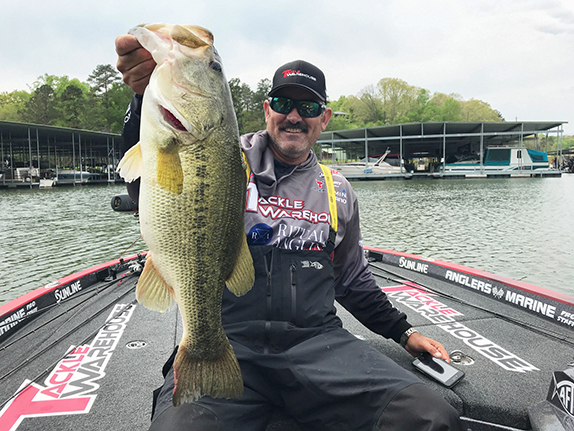 He held the lead after day 2, but his final-round stringer was his smallest of the event and left him almost 4 pounds behind winner Ott DeFoe. 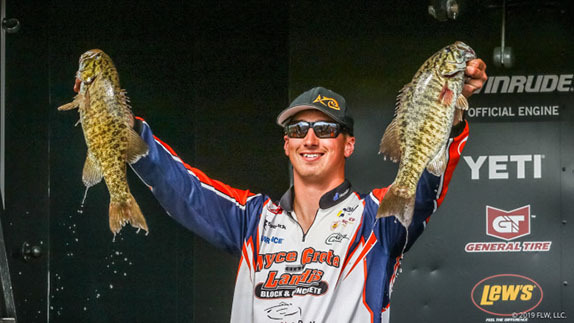 He spent the tournament in the mid to lower portion of Lake Loudon, which was where the vast majority of the contenders concentrated their efforts. The water there wasn't as high or dirty as it was in a lot of places and the main-river current was moderate. He had three patterns going on � gradually sloping banks on the main river and flats in the creeks that he fished with a rattlebait, relatively steep banks that he worked with a square-bill crankbait and more vertical bluffs where fish were receptive to a deeper-diving plug. His rotation consisted of eight to 10 places where fish were holding in 1 to 6 feet of water. He weighed in 10 smallmouths, which was more than anyone else in the top 5 (a member of that species had to be at least 18 inches long to be eligible for the scale). His entire day-2 bag was composed of brown fish � the only such haul of the tournament. "I was catching about 20 fish every day," he said. "I had to throw back quite a few smallmouths that were just a little bit short. "When I'd get into an area, I'd make several casts into what I thought were the most productive zones. Angles were everything � (on day 3) I made 10 straight casts to a subtle current seam around a dock and got no bites, but then I moved closer to the bank and changed the angle and caught a good one on my first cast." > Rattlebait gear: 7'3" medium-heavy Duckett Fishing Jacob Wheeler Signature Series rod, Duckett Fishing 360 RB casting reel, 17-pound Sufix Advance fluorocarbon line, Storm Arashi Vibe (red craw). > Cranking gear: 7'2" medium-action Duckett Fishing Jacob Wheeler Signature Series rod, same reel, 14-pound Sufix Advance fluorocarbon, Rapala DT 6 (demon) or unnamed square-bill crankbait (red). Jesse Wiggins' weights kept going up throughout the tournament. Jesse Wiggins' weights trended in a positive direction for three consecutive days. That wouldn't have been the case if he'd landed his two biggest bites on day 2. "Those were the only two fish I lost all week," he said. "I still wouldn't have had enough to win, but that cost me 4 pounds. He started out throwing a Jackall Bling 55 square-bill in practice. He hooked a broken line that had custom-pained flat-sided plug attached to it and, figuring the angler who lost it probably knew what he was doing on the venue, he began fishing it. He eventually surrendered that bait to the lake, just as the previous owner had, but was able to find two just like it at a local tackle shop and managed to keep those throughout the event. He also employed a Strike King KVD 1.5 for its propensity to come through laydowns. He focused on laydowns on flatter banks and little rough spots on points. The vast majority of his fish came from the 5- to 7-foot depth range. "I had two whole creeks that weren't getting much pressure � I only saw one or two other boats the whole time. I'd go through the both twice every day. I hit some other places too, but those two were where I caught them all." > Cranking gear: 6'10" medium-heavy St. Croix Legend glass composite rod, unnamed casting reel (6.4:1 ratio), 12-pound Seaguar AbrazX fluorocarbon line, custom-painted square-bill crankbait (reddish with some green mixed in) or Strike King KVD 1.5 (red craw). Mike Iaconelli had a spot the was phenomenally productive in the early morning on days 2 and 3. 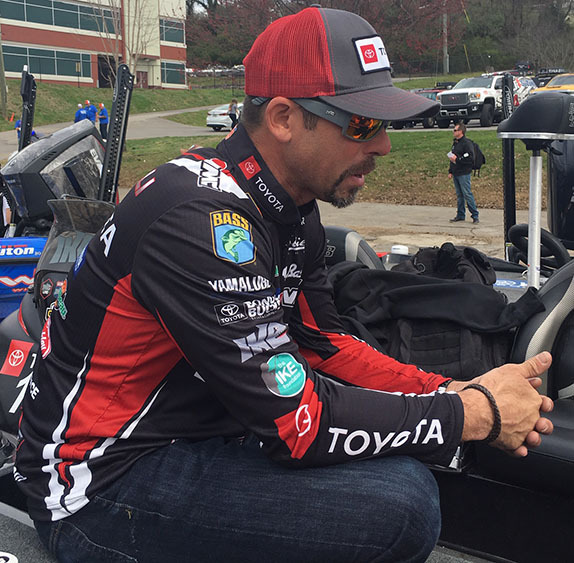 Mike Iaconelli recovered from a lackluster day 1 to post his 11th top-10 finish in 20 appearances in the Classic. He did most of his damage on days 2 and 3 in the first couple hours from a culvert surrounded by natural rock backed up by rip-rap. There were periods on both days when he was getting bit on nearly every cast. "It was special because they're normally not ganged up like that in the pre-spawn � that's usually a post-spawn/summer thing," he said. "The conditions made it a double-whammy because you had flat, natural rock and the culvert that was drawing current. Fish were going in to spawn and coming out because the current was dropping. "In practice, I though the (maximum weight) for that place was 10 pounds because I never caught one over two. I'd catch one and look down and there'd be eight or 10 other fish behind it, but they were all the same size. It got a lot better on the second and third day � there were some bigger ones there." Twelve of the 15 fish he took to the scale bit a Rapala DT 6 crankbait. He used the Caribbean shad color on the first two days and switched to smash (also a shad imitation but with a green back and some orange on the throat) when the water cleaned up a bit on day 3. He changed casting angles frequently and said it was critical for the bait to contact the bottom. "It was a total deflection bite," he said. > Cranking gear: 7'3" medium-action Abu Garcia Ike Signature Delay rod, Abu Garcia Revo Ike casting reel (6.6:1 ratio), 10- or 12-pound Berkley Trilene 100% Fluorocarbon line, Rapala DT 6 (Caribbean shad or smash). > His other three fish came on either a half-ounce black Missile Ike's Mini Flip Jig with a Berkley Mini Chunk trailer (black/blue) or a Molix Water Slash spinnerbait (chartreuse/white with double Colorado blades) with a Berkley Power Grup (chartreuse) threaded onto the hook. Mark Daniels Jr. was within a pound of the lead on day 2, but boated less than 10 pounds on the final day. 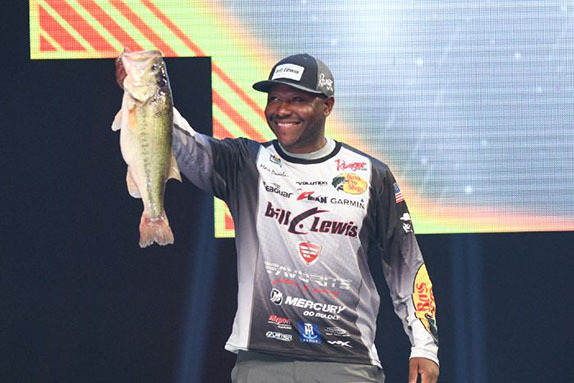 Mark Daniels Jr. was just a half-pound out of the lead after day 2, but his final-day haul was easily his smallest of the event and he finished more than 7 pounds off of DeFoe's winning number. He worked four main-river places that were all within 3 miles of each other. He pulled fish from depths that ranged from 2 to 7 feet. "I was fishing transitions, but not real obvious ones," he said. "I was catching fish that were making their way into the pockets (to spawn, but weren't quite there yet. A lot of them were on golf ball-size rock and there weren't too many other guys fishing that." He didn't get a lot of bites � averaging only seven or eight per day. He got just five on day 2, when he weighed his biggest stringer of the tournament. "I had one spot on Tellico that I never did get around to checking," he said. "It's water under the bridge now, but I would've liked to have gotten over there and thrown a couple of times." Two Bill Lewis baits � a half-ounce Rat-L-Trap in red crawfish and his new signature series Mr-6 crankbait � were his primary offerings. He caught all five of his day-3 fish on a square-bill given to him by fellow competitor Cliff Pace. "He makes it personally and I'm not sure what he calls it. I know he calls the color spring craw." > Cranking gear: 7'2" medium-heavy cranking rod, Bass Pro Shops Johnny Morris Signature Series Platinum casting reel (6.8:1 ratio), 15-pound Seaguar AbrazX fluorocarbon line, 1/2-ounce Bill Lewis Rat-L-Trap (red crawfish), Bill Lewis MR-6 (strawberry craw or chartreuse blaze) or handmade square-bill (spring craw). > He completed his limit on day 2 with a 4-pounder that bit a spinnerbait that was given to him by Wheeler. font size = 4>Much of the tackle referenced above is available at the BassFan Store. To browse the selection, click here..